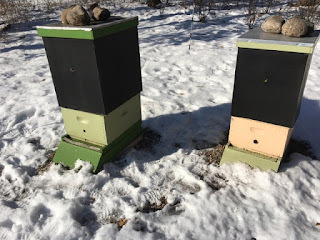 A beekeeper called me on Thursday with a hive dilemma. She knew one of her hives was seriously light on food. When she checked the hive it only had honey left on one side of a deep frame. Doing nothing means the bees will be dead. Yesterday turned out to be a beautiful sunny day right when I needed to go out and work with my hives, Mother Nature was kind. Here are some pics and thoughts from my day in the bee yard. I mixed and used about 12 cups of 1.25:1 syrup to fill 2 frames on both sides. It was a bit chilly outside so I put the frame into a plastic bin and contained the mess to my laundry room sink. This hive has a Carniolan queen so I’m sure their genetics have helped them get through the winter but luck with mild winter weather was also on their side. This hive was a new package last spring but struggled continually with mites and never built up into a strong colony. In November I gave them a last ditch treatment of oxalic acid using the dribble method, added a few Hop Guard strips for insurance and crossed my fingers. 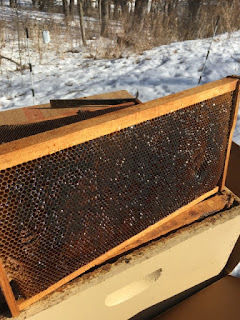 They didn’t produce any surplus honey last summer and even with heavy feeding in the fall the hive went into winter on the very light side, so I wasn’t holding out hope for successfully overwintering the hive. When I opened the hive this week and saw the cluster of bees I was very pleasantly surprised. They did not have much honey left, just the outer side of one frame, and I opted for emergency winter feeding to get them through to spring. I’m hoping it works. 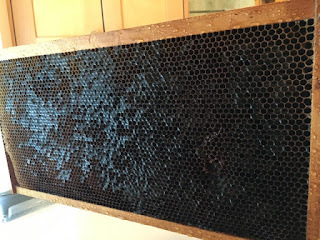 My other hive, which started last year as a divide with an Italian queen, built up early, produced a surplus of two supers of honey, and went into winter with a full deep laden with honey. I did treat for mites in September using Mite Away Quick Strips and then following up with oxalic acid using the dribble method in November. In contrast, when I checked their hive I found a cluster covering 8 frames and they have three full frames of honey remaining in the top box. Right now the bees have survived our January subzero temperatures without any problem, if they were on honey frames. If a cluster has food during below zero weather, survival is normally is not a problem. The January thaw that MN/WI is currently experiencing, has come at a perfect time. Right now most bee colonies have been transitioning from the lower box and moving into the top box of hive, Depending how much food was in the lower box(s). Some hives the bees have already moved up and hives that are very heavy with honey, may not have moved up yet. Once bees have moved up, as the calendar moves to February, brood rearing begins. The queen will start laying eggs. She starts out laying slowly and will increase her egg production over the next few weeks. This is the danger time for the hive. Once there is brood in the hive, the bees can't move off the brood. If they deplete honey around the brood, the bees have to move out away from the brood to get honey, this feed is used for their food and to keep the brood warm. Usually getting this honey is not a problem. But if the weather gets in single digits or below for more than one night, starvation can occur. When it gets very cold, the cluster has to tighten up to keep the brood warm. This can pull the bees off a frame of honey that they were using as a food source. The bees will not leave the brood no matter what. The hive will die trying to keep the brood warm. A beekeeper can help prevent this from happening by adding sugar, candy boards or winter patties. This gives bees some emergency food that can hopefully get the bees over this short cold blast. There is still some openings for this course. Discover everything you need to know to start your own apiary. 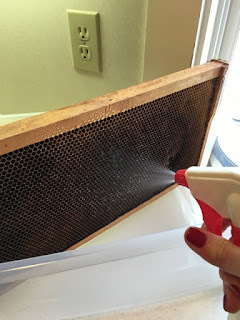 Learn honeybee biology and behavior, hive management and swarm prevention, what equipment is needed and where to get it, and how to harvest honey and take care of your bees year-round. Tomorrow, Sunday or late next week. Would be a good day to check and see if your bees are alive. Look to see if the bees are doing cleansing flights. There will be dead bees in the snow outside the hive. This is normal. No bees flying? Are they at the top hole entrance? Nothing yet? Rap on the side of the hive any buzzing? Nothing yet? Sometimes if the hive was very heavy with honey the bees could still be down deep in the hive. Put a veil on and open the top covers and look down deep between the frames. Do you see the bees moving down deep in the hive? If the colony is dead close it up and order some packages. If it is alive, great news. This is a video I did a couple years ago. Checking for hive, alive or dead and checking on food stores. I made this video a few years ago. It is still accurate on what the outside of a hive looks on a cold winter day. Even on a cold day, the bees are at the entrance. The pictures were taken by J. Linser. JoAnne has been teaching beekeeping classes around the metro for many years. She also is a Master Gardener. Discover everything you need to know to start your own apiary with JoAnne Sabin of the Minnesota Hobby Beekeepers Association. Learn honeybee biology and behavior, hive management and swarm prevention, what equipment is needed and where to get it, and how to harvest honey and take care of your bees year-round. Whether you wish to create a sustainable future in bees or prefer being a hobby beekeeper, this three-session workshop will address everything you need to practice the art of beekeeping: getting started, managing honeybees throughout the year, extracting honey and preparing your hives for winter. Registration is not yet available. Website link will be updated when available. Whether you are a 2nd year or more beekeeper or you're getting back to beekeeping, this class will refresh your memory on the very basics of caring for your honeybees. Topics include: installing a new package (two methods), inspections, swarm prevention, and making splits. Register in store at River Market, by phone (651) 439-0366, or email Ola at education@rivermarket.coop. If you already keep bees, this class is for you. Learn more about bee behavior, hive management, and equipment—beyond the basic woodenware and hive tool. 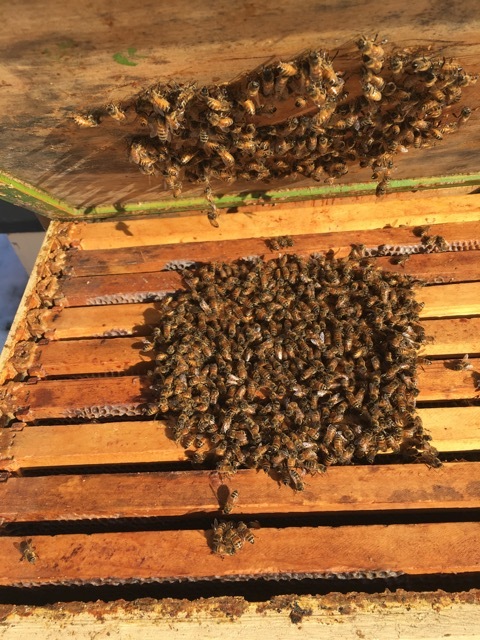 Get the latest news about bee health, swarms and simple queen rearing, as well as answers to those pesky questions that came up after the basics class. Prerequisite: Beekeeping Basics class and/or kept bees at least since this April. Registration available after March 1, 2016. This is the behavior beekeepers need. It is like hygienic behavior on steroids. Here is the link to our web page. Click the link. Print the form. Please send it to us with payment. If you can't print it out you can call us and we can send you one. If you have ever been interested in keeping bees, this is your opportunity to learn from a certified Master Beekeeper. This post is a brief summery of the 2015 bee season. The winter of 2015 was pretty much normal. January had some normal temperature swings. February had a couple cold days in the second half of the month that did kill some colonies. March started with colder than normal temperatures than quickly warmed up to above average, then back to average temperatures. Beekeepers that wintered their bees and treated for mites had nice looking bees at this point. Pollen patties went on. 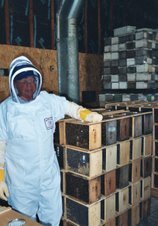 Beekeepers that did not treat for mites or had high mite levels had some dead outs due to viruses brought on by the mites. April is always our transition month. Package bees arrived, the first delivery had temperatures in the 40 - 60 degree range perfect for installation. The second delivery was initially nice but any late installers like myself, there was snow falling. My cold installs were done without any sugar water spray on the bees or the queen. All of the bees and queens made it fine. Overwintered colonies were building up fine with the hospitable weather. Not much for early pollen but the bees were consuming pollen patties at a fast clip. Late April did start to bring out early swarming on overwintered colonies that surprised beekeepers on the numbers of bees in the hive. If reversals were done the swarms were usually held at bay until they were divided. May was a spot on average month for temperatures. Package bees built up very nicely. Brood nests were expanding and pollen was coming in. Most of my 2 lb packages had four frames of brood. A few nuc suppliers in the area had their nucs coming in around May 7th. All of my package bees were much stronger than most of the nucs that were arriving with two to three frames of bees. Overwintered colonies were busting out of their hive by around May 7th. Divides were in order. There were ample queens available for anyone that needed them. Precipitation during late winter and spring was above normal making for good pollen from late April on. Beekeepers who didn't divide their overwintered colonies soon discovered that their hives would do a self divide. Swarming in May was a direct symptom of not quite enough management. June overwintered colonies and packages were building very nicely. Expansion of brood nests had more boxes going on the hives. Overwintered colonies had supers on by the 10th. Package bees were still filling their boxes out. 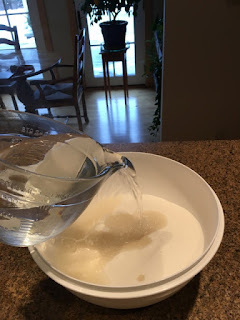 The main nectar flow started a little earlier than normal and it was very intense in many area's of MN and WI. Beekeepers with strong overwintered colonies that kept their bees from swarming, had three or four full supers of honey by the end of June. Packages, nucs and divides weren't up to their fighting weight yet and were on the sidelines for a great early nectar flow. July came temperatures never got hot through the whole month. This hurt honey production. By now packages and nuc's were up to full strength. Everyone had supers on. Basswoods were blooming and flowers were everywhere. The nectar flow started to become spotty. With some beekeepers filling all the supers they had on their hives and other beekeepers having a much smaller crop. This was in my opinion because there were not many days in the upper 80's and lower 90's. We had the moisture and good bee populations but the nectar wasn't flowing everywhere. Western MN had a very good nectar flow but St Cloud and points straight east into western Wisconsin did not have an exceptional honey flow. I guess this proves the point of an overwintered hive does produce much more honey than packages or nucs. Swarming was an issue in July. This is the time when we think swarming in behind us. The spotty flow is a direct cause of swarming in July. Bee populations are coming on strong and if there is not much honey to collect, it is like they feel that they may need to find a new home to help their survival. August came and what was hoping to be a Golden Rod flow fizzled to a collection of yellow pollen and not much sweat sock honey. When goldenrod nectar flows heavy, the bees bring it into the hive and the hives smell like wet sweat socks. The odor goes away as the nectar ripens into honey. The honey is actually very nice. Mid August gave way to some very humid conditions. Moisture checks on honey came in very low at first but as time went on and the humid conditions persisted the moisture levels in the samples I tested did rise. Most beekeepers were able to keep their moisture levels under 18.6% water content or U.S. Grade A. Some beekeepers did have some higher numbers and some steps had to be taken to dry out their honey. Some colonies were light on winter stores in August and beekeepers on top of their management started feeding then. They were easily able to get the needed syrup into their colonies by early Sept. The MN State Fair had a great showing of honey. Many beekeepers from around the state showing off their award winning honey. Volunteers were needed to staff the booth to answer questions from civilians. There was a large number of beekeepers that stepped up and helped out. I think we should all be proud of the Hobby Beekeepers. Their expertise in their craft amazed all the fair-goers. Sept and October gave us warm weather for feeding and most of us were able to get enough food into the hives. Many hives had high levels of mites in late August and early Sept. The preferred mite treatment was Formic acid(Mite Away Quick Strips, MAQS). The temperature for using formic was pretty good until late Sept. As it cooled of treatments shifted to ApiVar. Some beekeepers who did not treat for mites found their hives empty of bees and the hive full of honey. High mite loads leads to whole colonies absconding or early die outs due to viruses brought on by the mites. October and November found us treating our colonies again with the newly approved miticide, Oxalic Acid. This secondary treatment of mites worked out great. Many beekeepers found their hives became re infested with mites. 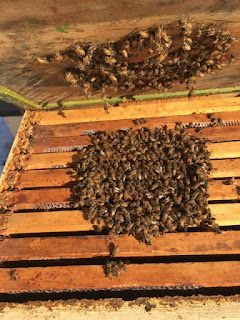 The Oxalic Acid brought the mite levels down again and the cooler temperatures had all the bees staying in their hives so there was no more passing around mites. November and December were warmer than average. I am not sure if that was good or bad. Good that the bees were not stressed at all from cold but it maybe bad if they ate more food than normal.